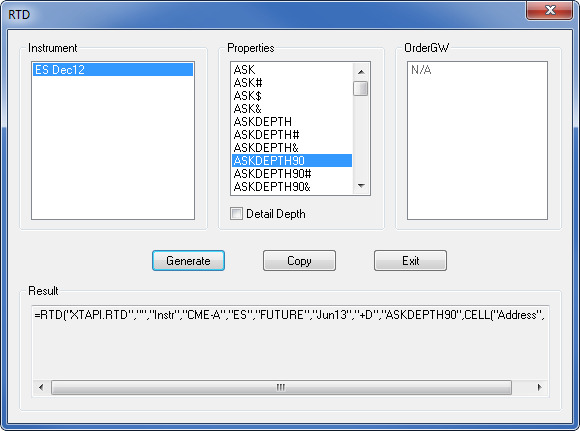 The RTD dialog box lets you copy formulas from the Market Grid or Autotrader and paste them for use in Microsoft Excel or Autotrader where they update dynamically. There are several hundred available formulas ranging from the Best Ask Price (ASK) of a contract to direction of the trade made at the last traded price (LTPDIRECTION). The formulas also exist in Native ($) Decimal (#) and Tick (&) formats. You must have Microsoft Excel 2002 or later to use formulas generated from the RTD interface. The RTD Generator includes the correct contract names for contracts with expiry days. In the Market Grid or Autotrader, right-click a cell in the row of a contract for which you want to generate a formula. From the Market Grid context menu, highlight Links and click RTD. From the Autotrader context menu, click RTD. The RTD dialog box appears. In the Instrument section, click to select the contract you want to use. Note: You can drag or drop other contracts from the Market Grid or Autotrader into the upper left Instrument section. In the Properties section, click to select a property whose formula you want to paste in Excel. Click to select Detailed Depth to generate detailed depth for the property. Note: This option is disable if detailed depth is unavailable for the selected property. Click to select the desired OrderGW the order will be sent though. In the Results box, the formula(s) appears. If multiple properties were selected, the formulas are in the same order as the properties. Navigate to Excel or Autotrader and paste the formula(s). In the RTD dialog box, click Exit.